Yes!!! Santa has been here! Put that camera away! We smell peanut butter! I, Daisy, am opening the package for all of us from Dougall and Floyd--Beef Liver Chips!!!! We love them! Here's most of our loot. Can you read this one????!!! I, Daisy, helped myself to some luscious peanut better cookies made by our friend Zuleika. SHE said I was naughty because I stole took the cookies. Then we went for our early morning walk. SHE said we were very naughty because we terrorised wanted to meet a small, white fluffy dog. BUT it doesn't MATTER because He already came! We have a long time until next Christmas...now, where are our Christmas bones. We hope Santa is good to you, too. After a 100 F day, it has finally cooled down enough for us to go outside. We were each allowed to open one of our presents. We chose the individual ones from Dougall and Floyd. I, Daisy, opened my present first! Roxy tried to take it! 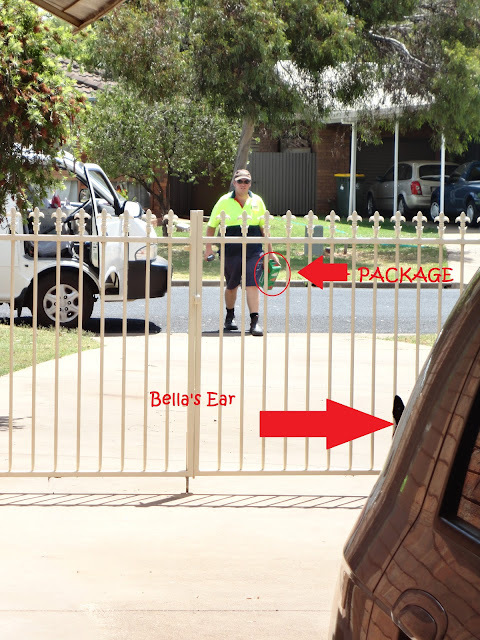 I helped Bella open hers. She got a great rope toy with a ball. Roxy tried to take all the toys. But we got them back! Look, I already removed an eye! Thanks Dougall and Floyd, you chose well. We have to are saving the package to all of us to open tomorrow on Christmas Day! Did you notice our paw-thetic Christmas Tree? Come on, we know you did....you were just too polite to comment. We've been looking at all of your lovely trees, with special ornaments and beautiful decorations. Ooooo a rare sighting of HER in the glass! Ours is a cheap-o thingy that only changes colour when you plug it in. No ornaments. Our usual tree is still packed away. goes to San Antonio, Texas. The tree can just be packed in the box easily. So we won't be blogging because we don't have a laptop or thumbs. And be back in Blogville about January 17th. It's the 21st and we're still here.....just letting you know. So far, so good! BOL! Look, what happened this afternoon. A stranger arrived at our house. Oooooooo, Bella, you should see all the stuff. There's a present for each of us AND one for ALL of us! They smell just like Dougall and Floyd. They're our Christmas Gift Exchange partners organised by Jazzi. Whaddya mean we have to WAIT! We have received a couple of awards from our friends and we want to acknowledge their kindness in thinking about us. The first was from Ranger. He awarded this to us over a month ago.....OMD we are so slack. 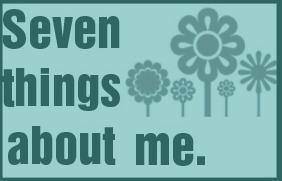 I, Daisy, have decided to tell seven things about myself, because is is MY blog. 1. I love sleeping on my back in doorways or the hall. 2. I'm the ambassador scottie. I allow people AND children to pat me. 3. Cats make me go berserk. 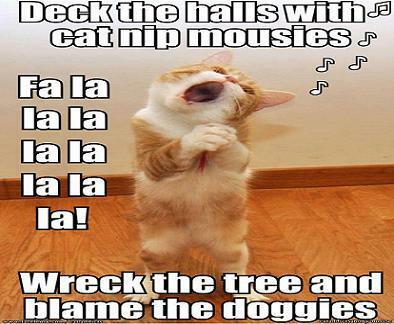 I emit a shrill bark and run wildly in circles--usually tangling up all the leads. 4. I love to roll in the grass. 5. To my great embarrassment, I cannot jump very high. I can get on and off the couch, but that's about it. I can't get into the car or on the big bed by myself. So I sleep under the big bed. 6. If I'm lying in the doorway, centre of a room or the hallway, Bella and Roxy are afraid to go by me, they cry like little puppies--I AM TOP DOG. 7. SHE calls me the Fun Police because I always try to stop the others when they play to rough--I just like to keep the peace. 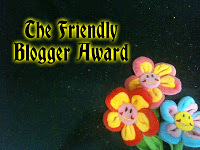 Our friend Cotton also gave us HIS 'The Friendly Blogger Award'. Yes, it's HIS. He MADE it to thank all the dogs who have been friendly to him and encouraged his blogging. If you haven't met Cotton, he's a rough, tough dude disguised as a fluffy, white cotton ball. We'd like to thank both Ranger and Cotton for giving us these awards! Kendra went to the Bridge. Doing the scottie sit and catching treats. Daisy Bella and Kendra suffering through another photo shoot. Bella, Daisy and Kendra showing off the bandanas the Rocky Creek Scottie sent. Always guarding the house from ever present dangers. Just being her goofy self. But SHE says that Bella and I have each taken on some of Kendra's traits. AND sometimes we think we see her lying in her favourite spots. As you know from my last post, I got to meet Santa Paws. What a top bloke. He gave up his valuable time to come way out here in Woop Woop to help unfortunate animals. The money raised from the pictures with him, went to the RSPCA. Most of you noticed that there were two pups missing from our photo. Bella would not have coped at all. Her ears and tail would have disappeared and she would have registered on the Richter Scale. She doesn't like people. Except HER. Roxy would have been too excited.....bouncing around trying to kiss everyone including Santa...slurping his lenses, chewing his beard. She would have been a blur. That left ME. SHE says I'm pretty much bomb proof. But even I got very excited walking around the shop. There was so much to look at: other dogs meeting Santa and some dogs and cats waiting to be adopted. What the......! Maybe Bella needs this. Yum.....pig's ears....sheep's ears....'roo jerky....beef treats. What do you mean we're just buying SHAMPOO??!! I tried the water in both bowls at the refreshment stand. And everyone thought I was just gorgeous.....of course. HER's--the questionable cards are in the office. Oh just another matter to clear up, we haven't seen the stray dog again. He looked well cared for, so we hope he found his family again. A Break in the Weather!